The 35 metre motor yacht Tamara RD, jointly listed for sale by Giulio Riggio at Fraser and Jochen Brill at Northrop & Johnson, has been sold with Marc Händle at Ocean Independence introducing the buyer. Built in aluminium by Italian yard Cantieri Navali Lavagna (CNL) to a design by Luca Dini, she was delivered in March 2010 as a semi-custom fast planing yacht in the yard's Admiral series. ABS classed and MCA compliant, she can accommodate up to ten guests in five double staterooms, all with entertainment centres, Samsung television screens and en-suite bathroom facilities. In addition, she has quarters for three crew onboard. Her expansive main saloon has comfortable seating in a large relaxation area in front of a 50-inch Pioneer television, while forward is the formal dining area and galley. The aft deck is fitted with everything necessary for al fresco dining and entertaining, while the well-equipped flybridge has a barbecue grill, ice maker, fridge, 42-inch waterproof television screen and a Bimini top. Tamara RD also comes with a full range of water toys including a Castoldi tender, Jet Skis and a professional Bauer dive compressor. 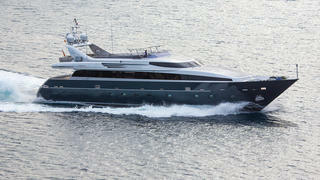 Twin 2,774hp MTU diesel engines give her a cruising speed of 28 knots and a maximum speed of 30 knots. Tamara RD was asking €5.9 million with VAT paid.